Carlisle is still one of the grand stations of Britain, with many important routes passing through it. In the twenty-first century it still has eight platforms - three mainline platforms and five bay platforms. We leave from platform 2, which is a bay platform, though you can only get on the train on one side. There are about ten passengers on our class 156 2-car unit, but no sooner are we all seated than we are told to get off and get on the unit behind us! We leave Carlisle on time and pass another Class 156 2-car unit coming in from Newcastle on the left. We then leave the West Coast Mainline behind us on our left and turn south westwards. We are just crawling along as we pass large industrial units on our right and some sidings with a shed, (Carlisle Currock) on our left. It's all overgrown, but is still standing and possibly is still used to stable units. We are now out in open country and start to speed up. There are cows to be seen in the fields and then we go into a cutting and out onto an embankment. The river Caldew runs next to us on the left briefly before we enter another cutting. We then pass a factory on the left and some houses as we make our first stop at Dalston - only we don't stop. We just slow down in case any passengers are waiting on the platform, but as there aren't any today, we speed up again. The old red brick station building is still there, but now boarded up. Back out in the countryside we see sheep on both sides now - in fact one field has both sheep and cows grazing amiably side by side. We slow again for a red signal and pass fields of sweet corn on the left and an old gravel pit on the right. We get the first view of the hills of the Lake District on our left as we speed up to about 50 mph. It's quite isolated here with just the odd farm to be seen. We pass through the remains of Crossthwaite & Crofton station, which still has its station house intact. We then enter another cutting as the weather becomes cloudier. We see more houses on the left and what looks to be like an oil rig in the middle of an industrial complex. Then we pass an old windmill and come to a stop at Wigton station. It has a wide single platform with two shelters and the original footbridge painted in dark green. As we leave we pass a semaphore signal and then Wigton signal box. There are some sidings on the left leading into the factory site, but these seem to be no longer used. We enter another short cutting before emerging to get a clear view of the mountains of the Lake District on our left. We pass through several more cuttings before we gain views in the distance on the right across the Solway Firth to the mountains of southern Scotland. In fact near here there used to be a line that crossed over a viaduct to Scotland, mainly to carry the coal traffic from this once busy coalfield. The fields now have wheat growing in them and this area seems more arable than pastoral. We pass through a wood, before entering a cutting and passing through a short tunnel, as we slow for Aspatria. The station platforms have been modernised here, though the original red brick station building is in good condition and obviously lived in. There are the usual bus stops on both sides as well as the original green footbridge. Next to the station on the left is the Lake District Creamery factory. We speed away reaching around 60 mph as we pass plenty of sheep and cattle in the fields. You can see the River Ellen on the right, as we slow once again and then move into a cutting. There are some hills on the left as the track curves sharply to the left, all the while the river getting wider. The land becomes flatter again and we see plenty of houses on the right and then the A596 as we approach Maryport, our first station on the Cumbrian coast. The station is inland, away from the sea and has just one platform on the west side of the track. Interestingly we are back to electronic signals again here. Two lines appear on the left. They are rusty and come to a stop at the station, which has a large green-framed shelter. We pass a signal box and the two lines become single track again, before ending altogether. We pass under the A596, which now stays on our left from now on. There are light industrial units on both sides as we now get our first glimpse of the sea. The sun also comes out and the first train of the day to pass us, appears. This is a short container train, though I miss seeing what is hauling it. You can now see the mountains of Southern Scotland very clearly across the estuary now. We come to a stop at Flimby station, where one person gets on. There are two platforms, much bigger in size than Maryport, with shelters and the original footbridge. We are right next to the sea here. Soon after we pass the first wind farm of the journey on the left, with all the blades turning quite slowly in the wind. There is an Icesan Factory on the left and then we speed up to 60 mph, passing a chemical works and an out of town shopping centre on the left. There is another wind farm and the sight of docks on the right indicates that we are approaching Workington. We cross over the river Derwent before we come to a halt at Workington station. It still looks like a grand old station, with yellow brick station buildings and pretty flowers in hanging baskets. The staff certainly take a pride in the upkeep of their station. Our guard changes here, as do at least twenty passengers. There is a 3rd bay platform on the left and as we leave, we pass a signal box. There is a large marshalling yard on the right, which is in the process of being cleared. You can see piles of rails waiting to be taken away and an old coal spoil heap on the right, a reminder of the days when this area was in the middle of a bustling coalfield with several branch lines. We then go back to sea views as the line curves left under a cliff and we see a small harbour on our right. There is yet another wind farm as we pull into Harrington station. It has two platforms with a shelter on each one and the platform floor is made up of modern concrete slabs. The train screeches loudly as we move sharply to the right with close up views of the harbour. We now come round the edge of the cliffs here, hugging the cliff on our left and the sea on our right. The track is single here and was originally double, but because of safety issues has been reduced to single track. For the next few miles we turn left, then right as we follow the steep cliff edge. A "15" sign explains why we are going so slowly, as I suppose here there is the possibility of rocks falling onto the track from the cliff face. The sight of netting over some of the cliffs here confirms my thoughts. Finally the track becomes double again as the cliff recedes and we speed up briefly, before stopping at Parton station, which has a signal box. It also has two quaint shelters and the first passenger train of the day passes us on the other track. Soon after we leave there is more cliff on the left, though this time there is a brick wall just inches away from us, offering protection as we hit 40 mph. The line curves along the coast and soon we get our first glimpse of Whitehaven harbour below us on the right. We soon arrive at Whitehaven station, which has a signal box and a sign says "Whitehaven Depot", though I can't see any signs of sidings here. The station has two platforms though only one track - the other platform is decaying rapidly and not used anymore. There is a modern building housing the ticket office and waiting area, as well as a small bus shelter in blue Northern livery. We leave the station and straight away go into a tunnel under the cliff, taking us under the town of Whitehaven, which is our half waypoint on the journey. We come out at Corkickle station, which has a large red brick station building. There are signs of old track here and an old line off to the right down to Whitehaven harbour. We start going inland now and speed up to 60 mph as we continue along single track as far as Sellafield. We enter a deep cutting and then emerge into green fields with a large hill on the right. There are plenty of sheep here as run parallel to Pow Beck on our left. We then slow as we arrive at St Bees, which has some elegant Georgian houses on the left and the famous school on the right. We go over a level crossing and onto a well-presented two-platform station, with a red brick station building. Around five people get on here, mainly walkers going further down the line. We are now back onto single track again. It is quite hilly on both sides now, but then the sea appears again on the right and this will stay with us as far as Millom. It looks quite choppy today. We slow down but don't stop for Nethertown station, which has one platform with a shelter, but no houses nearby. We get a brief glimpse of the Lake District Mountains through the cliff on the left, but on the right it's just sea to be seen. We slow for Braystones, which has a single station building, which is now a private dwelling, with a caravan site beyond. We don't stop here though, as we pass more hills​ and Sellafield comes into view ahead with all its various towers. We slow down as a siding appears on our left and we pass under some sort of bridge, all covered in white plastic - carrying nuclear waste to the sea possibly? 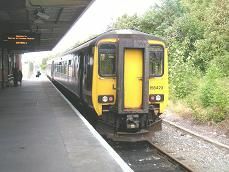 We pass Sellafield signal box and then stop at Sellafield station, which has two platforms. Four people get on. There's the original station house with a new extension and a footbridge over to the other platform, which has a large perspex shelter. We pass the rail entrance to the power station on our left, with various sidings filled with DRS Class 20's and 37's and some nuclear flask wagons. We then pass a golf course on the left, before we come into the small seaside resort of Seascale, which has two shelters on the eastern platform and looks very basic. ​2 people get off. There's a nice tower on the left next to the station. We then get a clear view of the Lake District Mountains on our left, as it is all sheep farming land now. Then a cutting spoils the view! We are now cruising at 60 mph and then quickly slow down as we come into Drigg station, which is attached to the Victoria Hotel pub. There are two small shelters here and the original station house is now a private dwelling, but it does house a "crafts and coffee shop". There's some steps put on the edge of the platform to help passengers getting off the train, as the platform is much lower than on other stations on this line. The sea moves away and we get sand dunes on the right, whilst on the left you get the best views of Great Gable and Scafell Pike. Sadly the summit of Scafell Pike is covered in clouds today. We then go over the estuary of the River Mite as we come into Ravenglass station, which is the busiest of the whole journey, with at least twenty people getting off or on. They've come mainly to visit the Ravenglass and Eskdale Railway, whose terminus you can see on the left, beyond the station. The station is nicely preserved with the Ratty Arms on the west platform and a museum on the other. We move on and pass onto a viaduct over the estuary for the river Esk and then speed up with views of Muncaster Fell and Black Combe on the left. We have lost sight of the sea on the right, though the Eskmeals firing range can be seen on the right instead. We soon arrive at Bootle station, which has a signal box and pleasant looking shelter on the western platform, as well as a well-preserved station building - now a private house - on the eastern platform. There are then fields on either side of us, which are mainly filled with dairy cattle, though some grazing sheep can be seen. The sea can be seen once in a while as we pass over the river Annas as the train does its best to catch up on lost time, reaching 60 mph on the non-welded track. We are the closest we ever get to the mountains now, with Black Combe towering above us on the left. Eventually we stop at Silecroft station, which has the usual plastic shelters, one of which has a payphone in it. There's a level crossing and a signal box here as we leave the A595 behind, as we go south and the road goes east, Another wind farm appears on the right as we speed up to 60 mph once again, passing more fields of cows and large farms. Houses appear on the horizon and we start to slow down as we come into Millom station. It is quite busy with about ten people waiting to get on. It has a large shelter and the original footbridge painted in green. The original station building has been converted into Millom Folk Museum. We start moving north east now, as we get a great view of the southern fells of the Lake District on the left and the Duddon Sands Estuary on the right. We stop next at Green Road station, which has been rebuilt. It's a sixties type brick building, though is all shut up. On the other side is a smaller brick built shelter. There are no houses to be seen and it soon becomes just marshland on the right. We then go on a bridge over the river Duddon and then start to go west as we come into Foxfield station. It has an island platform with a large shelter in the middle. We pass a northern bound train on the opposite track - the first train we've seen since Parton. Still travelling slowly round the estuary, we start to go southwest now. We pass a mountain on the left, which has been quarried and there are plenty of spoil heaps to be seen. We then stop at Kirkby-in-Furness station, which has two bus stops, one with a payphone, and the original footbridge. We then speed up again, as we start to see a sandy beach on the left and marshland on the right. Askam station has two original wooden cladded brick buildings and a crossing box. Then it starts to get hilly again. We pass the signal box at Park South Junction as the Barrow avoiding line leaves us on the left. We go southwest onto single track and under the A590 as we pass factories on the right and houses start to appear on the left. We pass under the A590 again and then start to enter the town of Barrow. The line becomes double again as we pass sidings on the right and then come in to Barrow-in-Furness Station. It has three platforms, two of then on an island platform and is in the middle of a straight section of track. Although it's a terminus station for most trains, it doesn't have a bay platform.